Specifically, Sanders wants the United States to adopt a lot of the spending policies that many of the Scandinavian countries (Denmark, Norway, Sweden) are commonly known to have. Policies such as government sponsored college education, paid parental leave, and universal healthcare. Many of these new government programs would be expensive and necessitate higher taxes. It is instructive to look at how Scandinavian countries structure their tax systems in order to raise revenue for these programs. Interestingly, some of the ways that Scandinavian countries raise revenue may make Sanders, who is a proponent of highly progressive taxation, uncomfortable. Scandinavian countries are known for having high taxes on income. According to the OECD, Denmark (26.4 percent), Norway (19.7 percent), and Sweden (22.1 percent) all raise a high amount of tax revenue as a percent of GDP from individual income taxes and payroll taxes. This is compared to the 15 percent of GDP raised by the United States through its individual income taxes and payroll taxes. In order to raise a lot of income tax revenue, income tax rates in Scandinavian countries are rather high except for in Norway. Denmark’s top marginal effective income tax rate is 60.4 percent. Sweden’s is 56.4 percent. Norway’s top marginal tax rate is 39 percent. However, the rates are not necessarily the most important feature of the Scandinavian income tax systems. 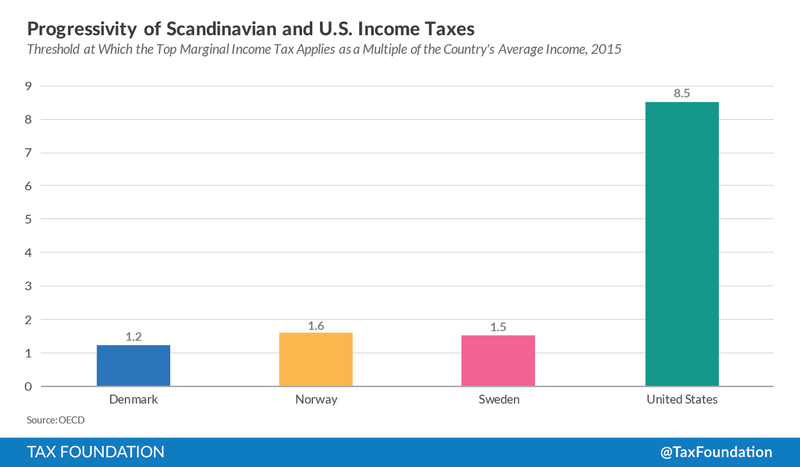 In fact, the United States’ top marginal income tax rate is higher than Norway’s and only 18 percent lower than Sweden’s, yet raises 40 percent less income and payroll tax revenue than Norway and 50 percent less than Sweden. Scandinavian income taxes raise a lot of revenue because they are actually rather flat. In other words, they tax most people at these high rates, not just high-income taxpayers. The top marginal tax rate of 60 percent in Denmark applies to all income over 1.2 times the average income in Denmark. From the American perspective, this means that all income over $60,000 (1.2 times the average income of about $50,000 in the United States) would be taxed at 60 percent. 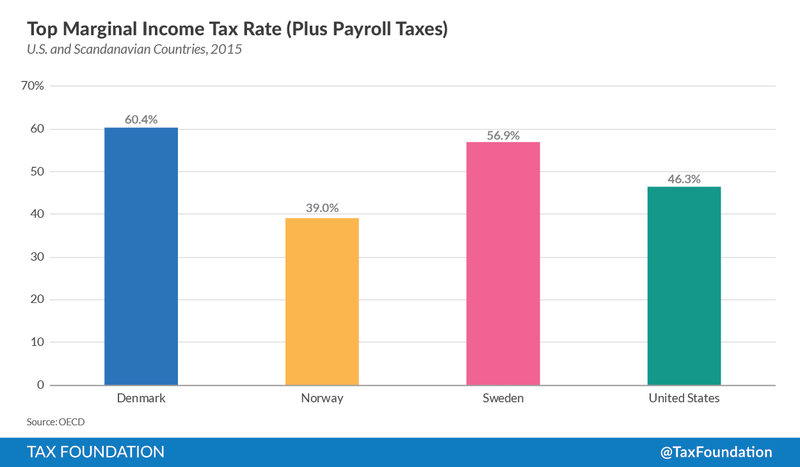 Sweden and Norway have similarly flat income tax systems. Sweden’s top marginal tax rate of 56.9 percent applies to all income over 1.5 times the average income in Sweden. Norway’s top marginal tax rate of 39 percent applies to all income over 1.6 times the average Norwegian income. Compare this to The United States. The top marginal tax rate of 46.8 percent (state average and federal combined rates) kicks in at 8.5 times the average U.S. income (around $400,000). Comparatively, few taxpayers in the United States face the top marginal rate. In addition to the high payroll and income taxes, all Scandinavian countries collect a significant amount of revenue from Value-added taxes (VATs). Value-added taxes are equivalent to sales taxes, but levied on businesses throughout the production process. As a tax on consumption, VATs are economically efficient: they can raise significant revenue with relatively less harm to the economy. However, many (especially in the United States) see VATs as a regressive tax because they fall more on those that spend a larger share of their income, mainly the poor. Denmark collects about 9.6 percent of GDP through the VAT, Norway collects about 7.8 percent, and Sweden collections about 9 percent of GDP. All three countries have VAT rates of 25 percent. The United States does not have a national sales tax or VAT. Instead, states levy sales taxes. The average rate across the country is about 7 percent. The much lower rate only collects about 2 percent of U.S. GDP in revenue. While Scandinavian countries raise a lot of revenue from individuals through the income tax, payroll taxes, and the Value-added tax, they don’t really raise much more revenue than the United States from capital and business taxes and don’t have much higher marginal rates on capital income. In fact, their marginal corporate income tax rates are much more competitive than the United States’ rate. In 2012, the United States raised 2.5 percent of GDP from the corporate income tax, just below the OECD average of 2.9 percent. Denmark raised slightly more at 3 percent and Sweden raised slightly less at 2.6 percent of GDP. 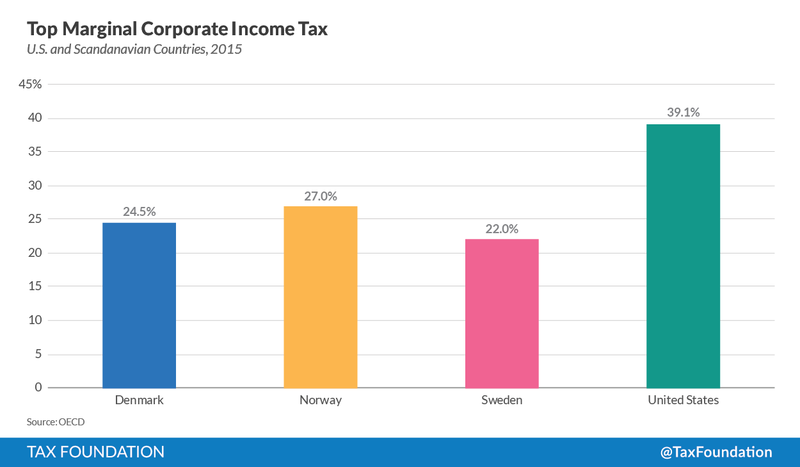 Norway is the exception with corporate revenue equal to 8.5 percent of GDP. Norway is situated on large reserves of oil and can charge companies a corporate income tax rate of 66 percent to extract the oil. 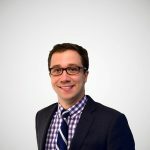 The taxation of capital income (capital gains and dividends) in Scandinavian countries is similar to the United States with the exception of Denmark. Denmark’s tax rate on dividends and capital gains is close to the highest in the OECD at 42 percent. Norway (27 percent) and Sweden’s (30 percent) capital gains and dividends taxes are more in line with the United States. 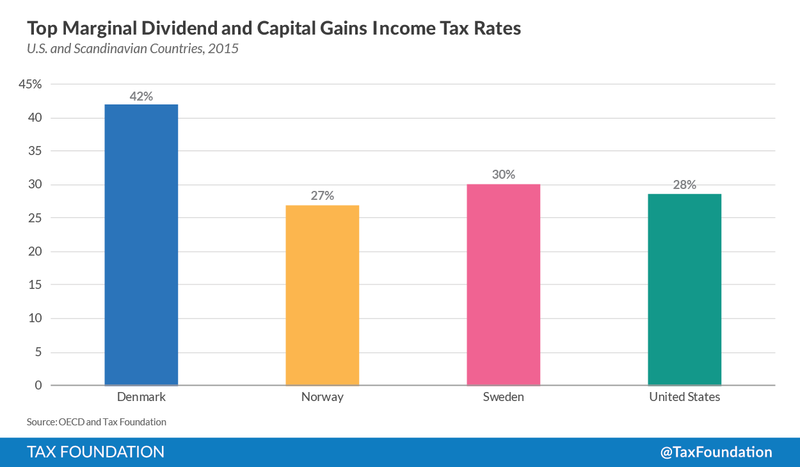 The United States’ tax rate on dividends and capital gains of 28.6 percent is slightly higher than Norway’s and slightly lower than Sweden’s. Finally, it is worth noting that the only Scandinavian country with an estate or inheritance tax is Denmark. A lot of the spending-side programs in Scandinavian countries cost a lot. Taxes would definitely need to be increased in the United States if it were to adopt them. If the U.S. were to raise taxes in a way that mirrors Scandinavian countries, taxes—especially on the middle-class—would increase through a new VAT and high payroll and income taxes. Business and capital taxes wouldn’t necessarily increase, in fact, the marginal corporate income tax rate would decline significantly. It isn’t a mistake that taxes in Scandinavian countries are structured this way. In order to raise a significant amount of revenue, the tax base has to be broad. This means higher taxes on consumption through the VAT and higher taxes on middle-income taxpayers through high payroll taxes. Business taxes are a less reliable source of revenue (unless your country is situated on top of oil). Thus, Scandinavian countries do not place above-average tax burdens on capital income and focus taxation on labor and consumption.